These are some notes/points to help you go over the First War of Independence, 1857 as asked in the ICSE Class 10 History Board Exam. Hope these help you while revision for the History Board Exam! What are the causes of failure of league of nation? thank u really it is points are as good as told by our history mam.mrs.veena r.menon…..
I’m glad you find them useful! 🙂 Keep visiting! What is the nature of the first war of independence??? Here is what I feel best answers your question as per my knowledge and level of understanding. 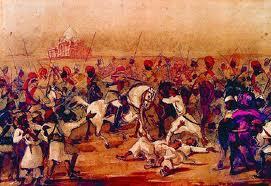 * The war signified restlessness and displeasure among Indians. * Indians realized the unfair methods and hidden motives of the British. * The war took place on a national level. Though it took place at different places across India, the people were united for once. * The war proved to be a turning point in Indian history. Indians rebelled against the British and stood up for their beliefs and traditions.